CCL Design Israel’s high temperature PCB labels are designed to withstand harsh process, protect electronic components and improve traceability of items in the SMT process, both reflow and non reflow. 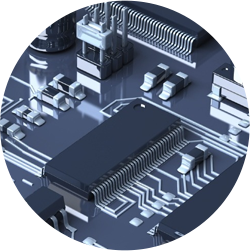 Effective identification of PCB and components within the SMT line prevents errors and enables automatic tracking of items during the whole process, starting from inception, through assembly and all the way to the end-user. As barcode technology is constantly evolving from standard barcodes into two-dimensional and round encryption among other methods in order to support a growing amount of data, CCL Design Israel’s pre-printed labels have been and will continue to stand at the forefront of technology and are willingly facing any printing or scanning challenge. CCL Design Israel specializes in the small dimensions of labels made for electronics assembly including PCB and components and our labels are available in standard and custom made sizes and shapes. The labels can be manually or automatically applied as part of the SMT production line. CCL Design Israel’s laser markable PCB labels combine the advantage of highly durable polyimide labels and laser marking capabilities. The result is an improved marking contrast, readability and durable printing that withstands aggressive product processed even after being marked by the laser. Laser marked PCB labels protect the surface on which they are applied and save adjustment time for the laser machines as the label remains the same. Polyimide – a synthetic label with high temperature resistance suitable for PCB’s and components labeling in SMT lines. Polyester – a synthetic label, suitable for indoor and outdoor uses, thermal transfer printable. Suitable as a permanent name plate and serial label for appliances and devices.